1. First, the alternate blocks needed to convey movement. 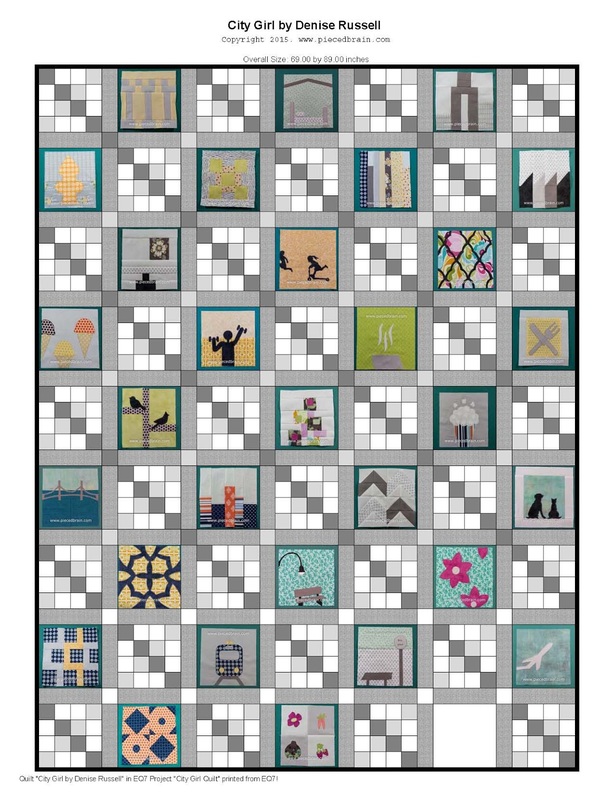 At first I thought of using flying geese, but a more appealing option for me was to use chain blocks, which also give the idea of 'grid' and 'intersections'. More city-like in my mid. 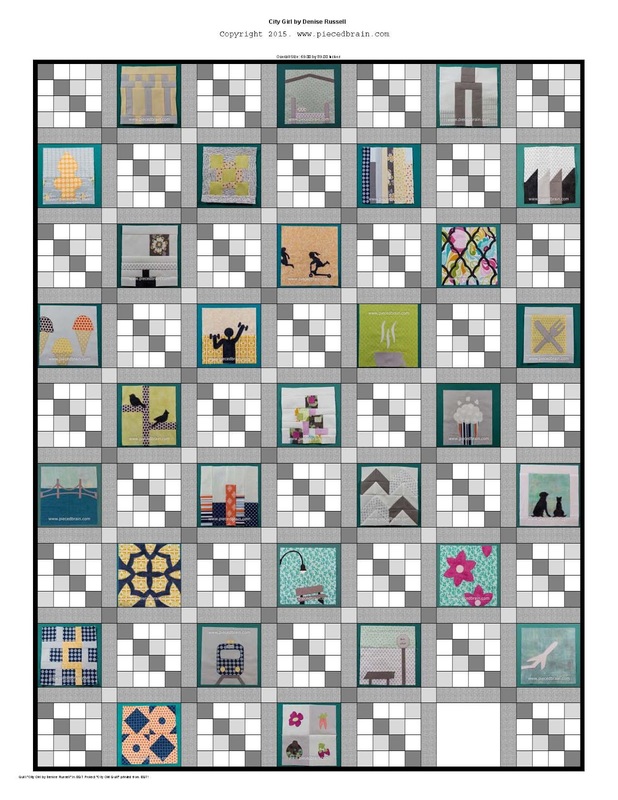 I decided to leave the last block blank because I will write on it the names of all the blocks on the quilt, sort of a 'map' to my city. 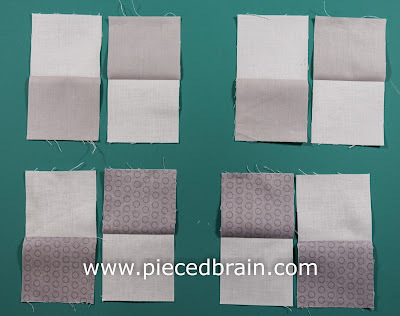 Although the alternating block is easy, I will give you a quick tutorial below, as well as a list of materials and yardage. I will leave this pattern and all block tutorials in the City Girl Sew Along page until I convert it to a pattern for sale in my Etsy store. Then, I will take the page down. 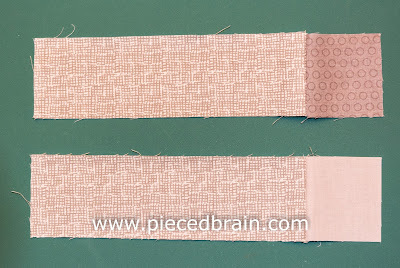 Stitch a white strip to each of the grey strips (light and dark). 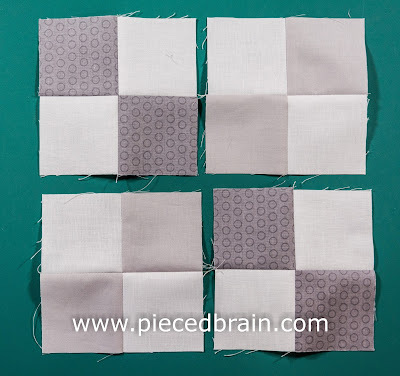 Cut them into 2-1/2" squares, press them open, and align them as shown above to make 2 four-patches with light grey/white and 2 four-patches with dark grey/white for each block (make 32 blocks). 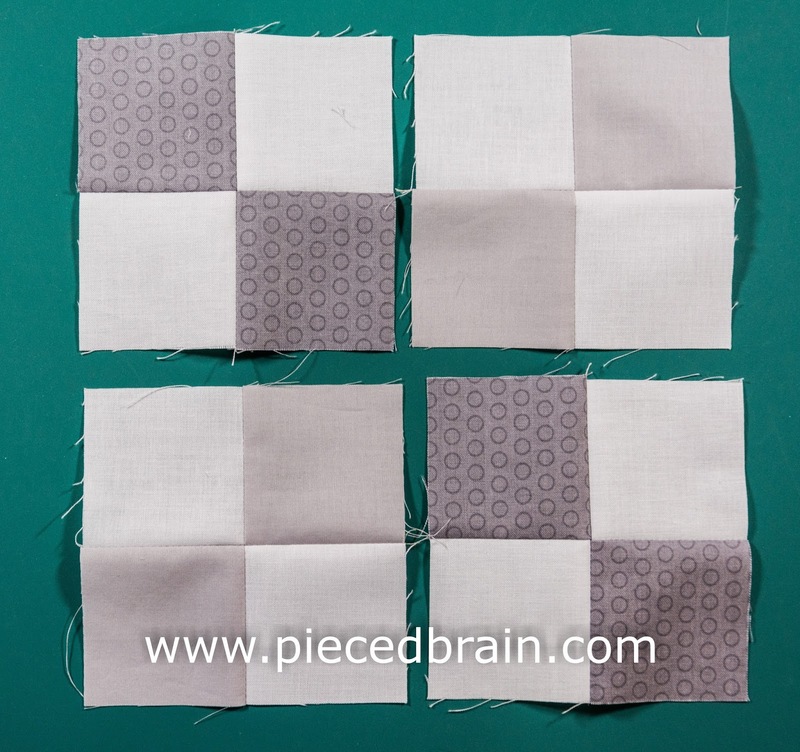 This block is perfect for chain piecing, so go ahead and chain piece the strips together, then cut the squares, press thm open, align the four-patches, pin, and stitch them all together. Stitch all four-patches together, ligning them up like this: dark grey/white patch on top left, light grey/white on top right, light grey/white on bottom left, dark grey/white on bottom right - this is important! - and stitch top row, bottom row, then join rows together. What do you think? Whether you use this layout or opt for a different one, send me a photograph and I will post it on this blog. This has been quite a fun journey! I am almost done with the alternating blocks and will post a picture as soon as the top is completed. I will get my master's degree next Spring so school is getting busier and busier. I have also made wall hangings for Therm-O-web to display at their booth during the International Quilt Market in Houston at the end of this month (I will post photos soon), and will be working on projects for another manufacturer next week for the same show. So, I am not sure when the City Girl quilt will be complete, but you will be the first to see it!. I am linking to Crazy Mom Quilts, Confessions of a Fabric Addict and Richard and Tanya Quilts. Wow, fun quilt. Love the connecting squares. Thanks! It took me a while to figure out which block I would use as alternate. Stunning pattern, thanks for the instructions! Thank you! It has been so much fun creating them! I love this design! Very creative. Thanks! I am stitching the last two rows and it is looking so cool! That looks fun! Great ideas in there. Love the movement created by the chain blocks. 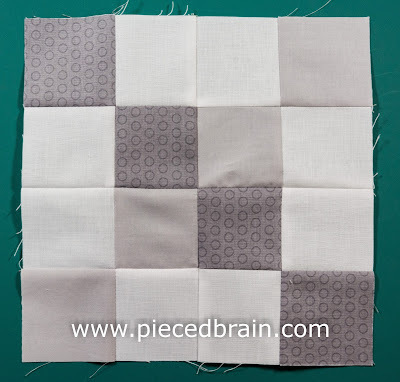 Popping in from Crazy Mom Quilts as part of my blog commenting challenge 300 in 30 days! 300 in 30 days! You go, girl! Denise - that is an awesome finish. I'm going to be a copycat!